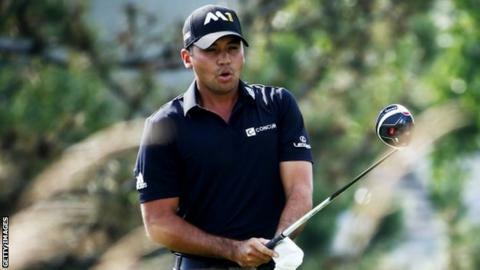 Australia's Jason Day failed in his attempt to card a 59 in the first round of the BMW Championship in Chicago but still hit a career-best 61. Play was abandoned because of bad weather on Thursday with Day, 27, facing a 44-yard chip on his last hole, to become the seventh man to card a 59. The US PGA champion had nine birdies and an eagle in his 10-under-par round. Day leads by four from a group of six, including American Jordan Spieth, who hit a hole-in-one on the second. Northern Ireland's world number one Rory McIlroy completed his round with six successive pars to finish on three under. Paul Casey is the highest-placed Englishman in joint 10th on four under, with compatriots Justin Rose and Ian Poulter among those tied for 32nd on one under.